Itinerary: Ntra. Sra. de Belén church - Constitución Square - Mayor St. - Town Hall Square - Mayor St. - Llavador St.- La Morquera - Blasco Ibáñez St. - Constitución Square - Ntra. Sra. de Belén church. Floats: Convocatoria. Note: This is the guiding float that announces every inhabitant in the town to participate in our Holy Week. Special attention must be kept to the horns sones. Itinerary: San Cayetano’s Church - Ronda Sur St. - Pio XII St. - Salitre St. - Dr. Mas Candela Sq. - José Manuel Magro St. - Corazón de Jesús St. - Constitución Sq. - Ntra Sra. de Belén Church. Floats: Entrada de Jesús en Jerusalén (Jesus entrance in Jerusalem). Note: A big crowd conduct the last work by Mariano Benlliure with many faithful people holding white palms. Itinerary: Ntra. Sra. de Belén Church - Constitución Square - Purísima St. - Francisco Candela St.- José Manuel Magro St. - Dr. Mas Candela Square - San Francisco St.- Peine St. - Blasco Ibáñez St.- Constitución Square. Floats: Stmo. Cristo de Difuntos y Ánimas (Holy Chirst of the deceased people and the souls). Polyphony: Coro Voces Graves de Crevillent: Cruz Santa (R. Mas Soler) (based on a Crux Fidelis fragment dated in VI century) and Velum Templi by José Alberto Aznar. Note: A much austere procession. The penitents wear monk habits; our Father image over their shoulders, no float, every light of the itinerary will be turned off, with the only light of the torches. It travels around the narrow streets of our “Vila vella” (old town). Itinerary: From all streets of the town to Ntra. Sra. de Belén church. Floats: Next 16 floats that will participate in the coming Passion procession. Note: From the places in wich we traditionally prepare every float “Arreglo de Pasos”, the 16 different passion sequences will be concentrated inside our Ntra. Sra. de Belén church where will be in exhibition. Christ’s Passion procession Time: 10.15 pm. Itinerary: Ntra. Sra. de Belén church - Constitución Square - Mayor St.- Town Hall Square - San José St.- Cantó St. - Pedro Soler St. - Salvador Mas St. - Francisco Candela St.- Médico Lledó St. - Purísima St. - Constitución Square. Floats: La Convocatoria - La Samaritana - El Lavatorio - Santa Cena - Oración en el Huerto - El Prendimiento - La Negación de San Pedro - San Pedro Arrepentido - La Flagelación - Ecce Homo - Jesús Rescatado - Ntro. Padre Jesús Nazareno - Stmo. Cristo de la Caída - Santa Mujer Verónica - San Juan - Virgen de los Dolores. Polyphony: Ruiz Gasch chorus: Motet to Ntro. Padre Jesús Nazareno (anonymous XVII century) Virgen de los Dolores popular chorus: Stabat Mater, O vos omnes, Plorans Ploravit. Note: The most representative sequences of the Passion can be watched by the work of arts of the XIX century from our brotherhoods. Interesting tour by the northern part of Crevillent. Moving procession Time: When the Christ’s Passion procession finishes. Itinerary: Constitución Square - Blasco Ibáñez St. - La Morquera - San Sebastián St.- Chapí Square - San Sebastián St. - Stma. Trinidad St. - Maciá Abela Square. Floats: Stmo. Cristo de la Victoria con María Magdalena - Tres Marías y San Juan. Polyphony: Coro Voces Graves de Crevillent: Christus factus est by José Ruiz Gasch. Note: Many faithful people follow this moving up to the Stma. Trinidad church although it is held late at night, around 3 am. Itinerary: La Purísima hermitage - Constitución Square - Mayor St.- Town Hall Square - Mayor St.- Carmen St. - Jorge Juan St. - Ribera St. - Maciá Abela Square - Remedios St. - Camposanto St. - San Sebastián St. - Paseo Calvario. Floats: Stmo. Cristo del Perdón y la Buena Muerte. Polyphony: popular chorus singing religious chants. Note: Massive participation in the praying of the 14 different seasons in the Via Crucis. Time: 6.00 am. Itinerary: Constitución Square - Mayor St. - Town Hall Square - Mayor St. - Llavador St. - La Morquera - San Sebastián St. - Chapí Square - San Sebastián St. - Paseo Calvario. 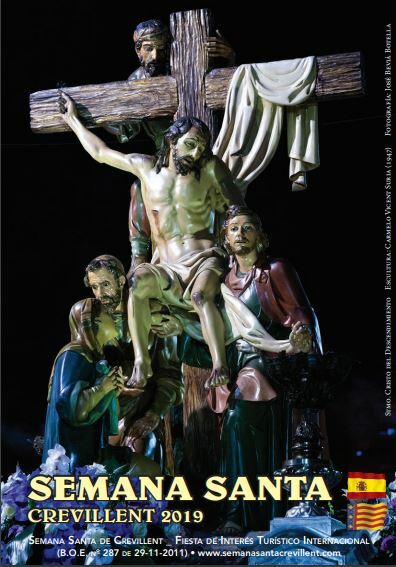 Floats: La Convocatoria - La Samaritana - El Lavatorio - Santa Cena - Oración en el Huerto - El Prendimiento - La Negación de San Pedro - San Pedro Arrepentido - La Flagelación - Ecce Homo - Jesús Rescatado - Stmo. Cristo de la Caída - Ntro. Padre Jesús Nazareno. Itinerary: Constitución Square - Blasco Ibáñez St. - La Morquera. Floats: Santa Mujer Verónica - San Juan - Virgen de los Dolores. Note: In our well known place called “La Morquera” it takes place our “El Abrazo” (the embrace by Jesús and the Virgin, his Mother) ceremony between our Virgen de los Dolores and our Jesús Nazareno to whom, previously, the Verónica has washed his face, leaving it printed on the linen. The meeting will be repeated in the Calvario. And in the Constitución square, always in the presence of San Juan. Time: 11.00 am Itinerary: Paseo Calvario - San Sebastián St. - Chapí Square - San Sebastián St. -La Morquera - Blasco Ibáñez St.- Constitución Square. Floats: La Convocatoria - La Samaritana - El Lavatorio - Santa Cena - Oración en el Huerto - El Prendimiento - La Negación de San Pedro - San Pedro Arrepentido - La Flagelación - Ecce Homo - Jesús Rescatado - Ntro. Padre Jesús Nazareno - Stmo. Cristo de la Caída - Santa Mujer Verónica - San Juan - Virgen de los Dolores. Polyphony: Virgen de los Dolores popular chorus: Stabat Mater, O vos omnes, Plorans Ploravit. Note: The exhibition of the floats in the Calvario. The musical backing from the drums and bugles bands. Itinerary: Maciá Abela Square - Stma. Trinidad St. - San Sebastián St. - Chapí Square - San Sebastián St. - La Morquera - Blasco Ibáñez St. - Constitución Square. Floats: Stmo. Cristo de la Victoria con María Magdalena - Las Tres Marías y San Juan - Stmo. Cristo del Descendimiento - Ntra. Sra. de la Piedad - Traslado al Santo Sepulcro - Stmo. Cristo Yacente - San Juan de la Tercera palabra en la Cruz. Note: The procession changes into a religious polyphonic concert in the streets of the town. 4 different Benlliure’s master works will participate in the event. Itinerary: Maciá Abela Square - Stma. Trinidad St.- San Sebastián St.- Chapí Square - San Sebastián St.- La Morquera - Blasco Ibáñez St.- Constitución Square. Floats: La Convocatoria - Stmo. Cristo del Perdón y la Buena Muerte - Virgen de las Angustias - Santo Sepulcro - San Juan - Virgen de la Soledad. Note: The presence of the different brotherhoods standards that won’t participate in the processions let us watch the magnificent embroidered works and the colouring variety. Time: 11.30 am Itinerary: Ntra. Sra. de Belén Church - Constitución Square. Floats: San Juan de la Palma - Regina Pacis. Polyphony: Orfeón Crevillentino: Alleluia (G.F. Haendel) Note: Regina Pacis meeting with Jesús Sacramentado; the Virgin changes her mourning clothing as a symbol of joy for the Resurrection.